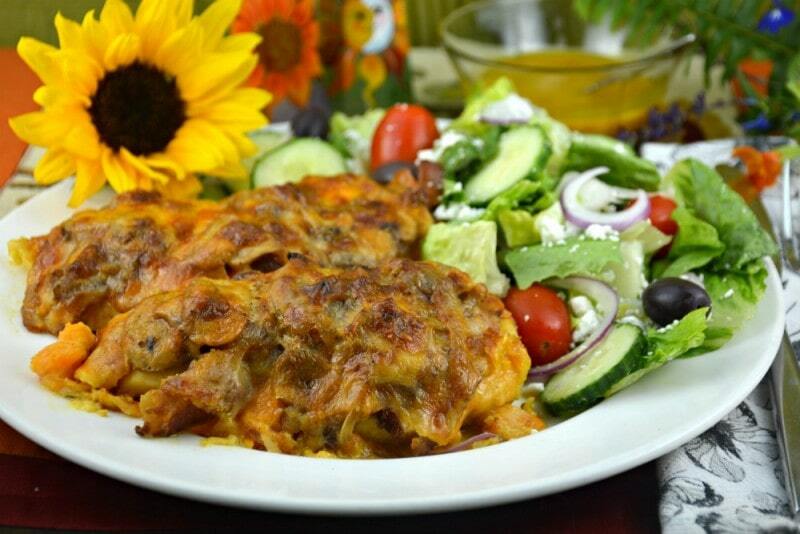 This mess is what The Best Alice Springs Chicken Copycat really looks like! Full of cheese, bacon, mushrooms, onions in a honey mustard style sauce! Ken, my husband, always laughed when we would go to the Outback Steakhouse because I never ordered steak, I always ordered Alice Springs Chicken. 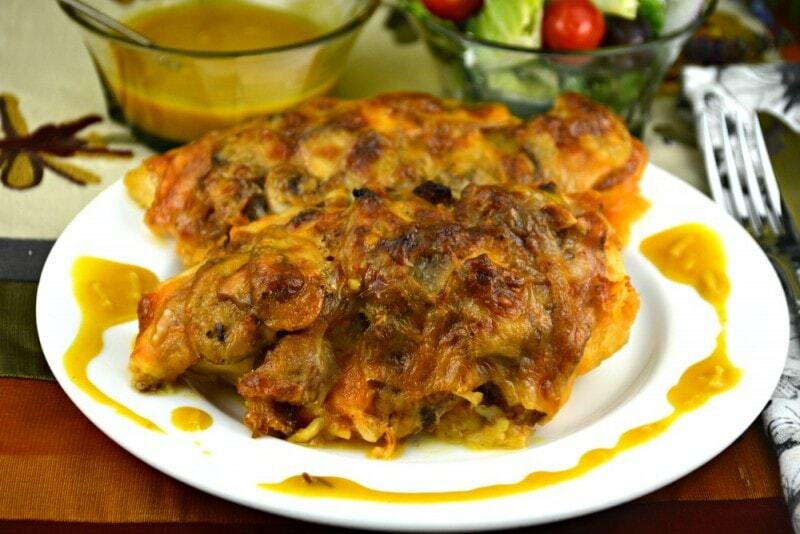 I just love this chicken dish so much I was inspired to create The Best Alice Springs Chicken Copycat recipe and I think it is fantastic, maybe even better than the original! I can’t even remember the last time we visited the Outback Steakhouse as Ken thinks our steak is much better now too! Regardless, every time I feel like Alice Springs Chicken I use this recipe and make it right here at home. 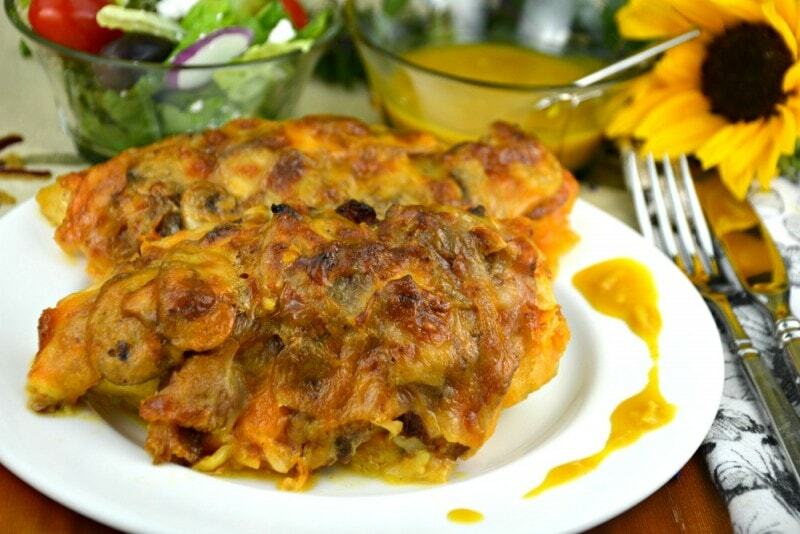 This mess is what The Best Alice Springs Chicken Copycat really looks like! Every bite is totally worth it, absolutely delicious! I tried to make a version that would look better for the photo but decided in the end to go with what this dish really looks like. This is also one of the first recipes I published when we started this blog. It is one of my favorite chicken dishes I make, and have made for so long. I just couldn’t wait to share it. 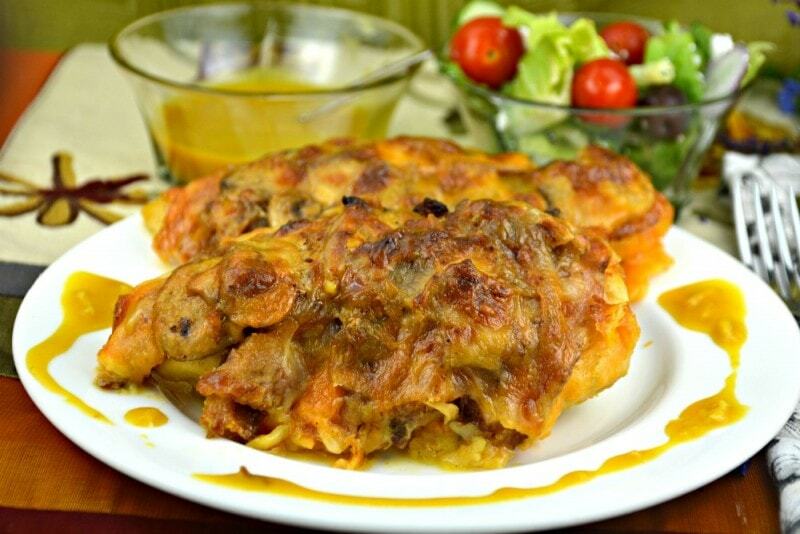 The Best Alice Springs Chicken Copycat recipe is fantastic. 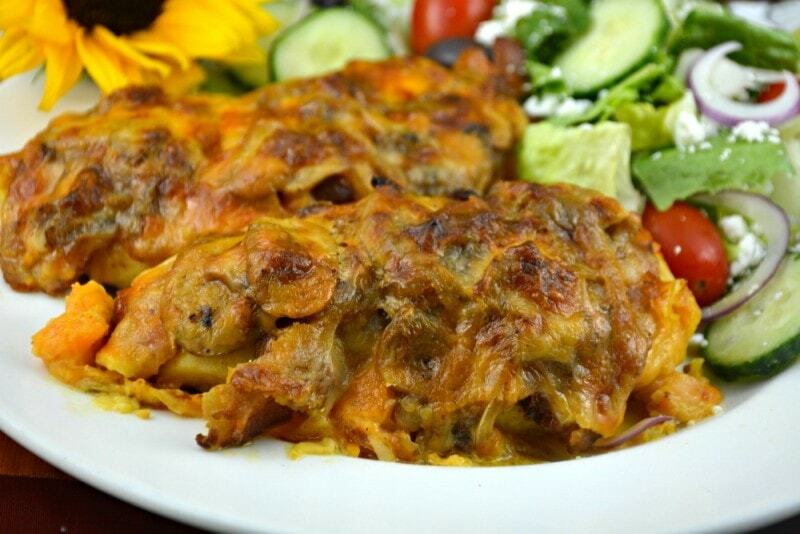 Boneless, skinless chicken breasts coated in a fantastic honey mustard mixture, topped with bacon strips, covered in fried onions and mushrooms, topped with Monterey jack and cheddar cheeses. All result in chicken perfection! There is a reason Alice Springs chicken is so popular at the Outback Steakhouse and now The Best Alice Springs Chicken Copycat recipe will be popular in your household too! You really have to give it a try! If this recipe isn’t for you I have listed some of our favorites below. You can never have too many chicken recipes! Hopefully you will enjoy them as much as we do! I just had to make a video for you all to see! 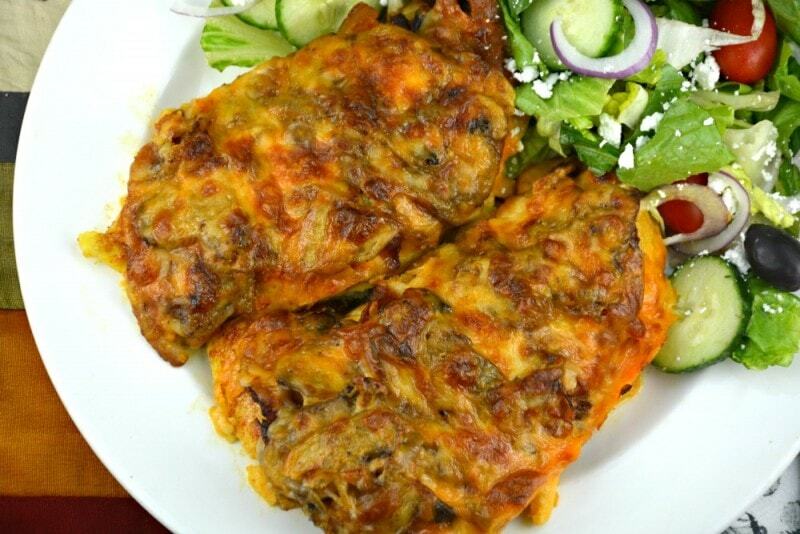 I am having trouble expressing how delicious The Best Alice Springs Chicken Copycat recipe really is. Take a moment to have at our video below! First you need to make the marinade. In a small bowl, combine mustard, honey, mayonnaise, onion flakes and lemon juice. Use a whisk to make sure mixture is totally blended together. Pour half the sauce into a small bowl, cover, refrigerate and reserve for later. Using a mallet flatten the chicken out a little bit, so the breasts are about the same thickness. This will help to equal your cooking time. I hate it when you have to overcook part of the chicken breast to make sure the other part is cooked! Place the chicken in a large resealable bag. Pour the remaining half of the marinade in the bag and toss the chicken around to coat. Remove as much air as possible. Marinate the breasts in the refrigerator for at least 2 hours, preferably overnight. Adjust chicken periodically while it is in the bag. When you are ready to make this chicken dish preheat your oven to 375 degrees. Prepare a rimmed baking sheet with foil and a light coating of cooking spray. Set aside. Remove the chicken from the marinade and discard the bag, marinade and all. Season each piece of chicken with salt, paprika and black pepper. Place on your prepared baking sheet. Bake for 30 minutes. While chicken is in the oven grab a frying pan or skillet and cook the bacon until it is almost crisp. Place bacon on some paper towel and set aside. You now have a choice to make here. You can either save a few tablespoons of the bacon grease to cook the onions and mushrooms or use butter in the next step. I do it both ways. It is up to you! This chicken dish turns out beautifully both ways. Using the same skillet, melt butter if you are not using bacon grease. Add the onions and mushrooms and cook for between 7-10 minutes. Onions and mushrooms should be tender. Drain and set aside. You will be using them in a moment. Remove your chicken from the oven. Brush each chicken breast with a little of the reserved honey mustard marinade. Place 4 pieces of cooked bacon, across each chicken breast. Spoon the sauteed mushrooms and onions on top of the bacon, being sure to cover each breast as evenly as possible. Sprinkle 1/4 cup Monterey Jack cheese evenly onto each breast followed by 1/4 cup of the Cheddar. Place the chicken back in the oven and bake for about 10 minutes (possibly longer if your chicken is really thick), or until the internal temperature of the chicken reaches 165 and the cheese has melted. Broil for a few minutes to brown the cheese. Serve with remaining refrigerated honey mustard sauce on the side. Absolutely delicious. Enjoy!